Weekly Innovation: 3-D Printed Fashion For Your Feet : All Tech Considered You can use a 3-D printer to craft yourself a cellphone case, a toy car or a new trachea. This week's innovation introduces 3-D printed high heels, and the print-and-wear fad as a growing trend. "Myth" is Continuum's flagship, 3-D printed shoe collection. Continuum is based in New York City. It's possible to print an ear, a trachea, or even a cast for your broken arm: Why not a shoe? Or two? If Mary Huang could have it her way, she would digitize her world and make everything around her using a 3-D printer. But for right now, she's sticking to shoes. And she's doing it with a Brooklyn-based "part design label, part lab" company called Continuum that says: "fashion should express how we live our digital lives." Huang designs the look of the shoe and the software that creates it to make it all possible. She says a pair of shoes takes anywhere from 16 to 20 hours to print — that's eight to 10 hours per shoe. The shoes are made mostly from plastic and thermoplastic polyurethane, a rubberlike material. They cost anywhere from $250 to $395 per pair. Even big-name brands are hopping on the 3-D bandwagon: Both Nike and New Balance have been experimenting with custom, 3-D printed plates on their cleats-n-sneaks. 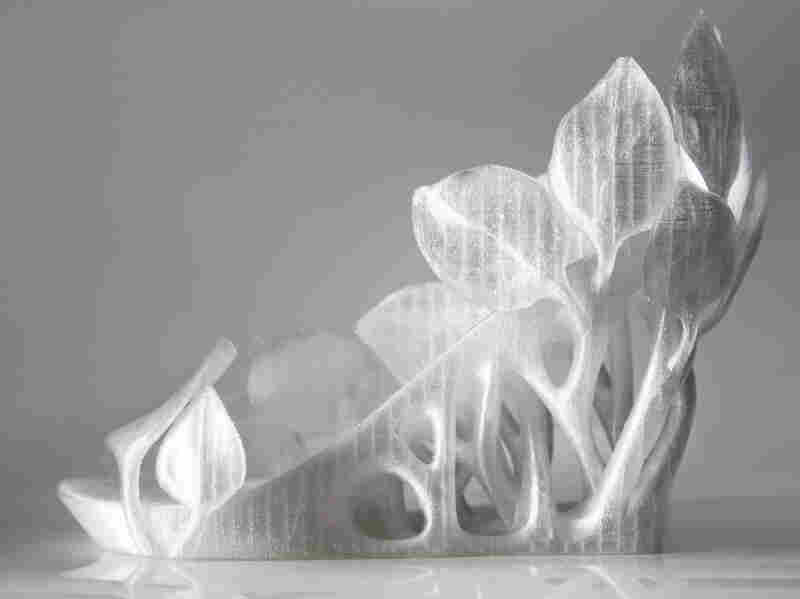 But how practical are 3-D-printed shoes, in general? Are they comfortable? Durable? Safe? The Daphne Shoe is meant to be for show, as art. "This design is more of an art piece. While it is wearable with ribbons tied around the ankles, it is not suitable for day to day wear. ... This design is meant mainly as an exhibition or collector's piece, or for special events. ... This can also be purchased as a single shoe, for half the price." Dr. Marlene Reid thinks 3-D-printed shoes have a future. Dr. Marlene Reid, a podiatrist, says our bodies are not meant to walk with our heels elevated 3 inches above the ground, or higher. It changes our biometrics, and our gait — we're "no longer walking normally," she says. But that doesn't mean we shouldn't wear them; Reid says we just need to "wear them smartly." Don't wear the same heel height every day: Your Achilles tendon and the muscles will become contracted and shortened. Stretch out your Achilles tendon after you wear high heels. Platforms can negate some of the heel height. Know your foot type, and which components of the heel or shoe are important for your foot. "I think that's a really cool future for us," says Reid, a podiatrist and owner of Family Podiatry Center in Naperville, Ill. "The real potential is in creating custom shoes." However, Reid is concerned about the materials they are made of, and that the shoes wouldn't be up to par with footwear standards. What Reid says she's afraid of is "in its infancy, that the tendency would be to make a shoe of one material or limited material. "Footwear has come such a long way in the development of materials and what they can provide for comfort and support," she says. "I think the technology has a lot of promise." Huang thinks of her new age, shoemaking process in the larger sense — how does (or can) it affect manufacturing? "It's not going to replace how we traditionally manufacture things, but it gives you another option," she says. Huang sees digital manufacturing as a potential way of changing how the global supply chain works. "The availability of cheap labor in the world is going to get more scarce," she says. "It's not that this would be a good process for everything we would want to design. It's a new process that has new benefits." Continuum Shoe 3D printing Timelapse from Continuum Fashion on Vimeo. Huang says 3-D printing is a long-term technology: The goal is to learn and grow with it. And now is only the beginning. Allie Caren is a digital news intern at NPR, where she writes about tech-related news and innovations. She has "sort of, kind of" flat feet, and trips all the time. Follow Allie on Twitter @alLISTENc.